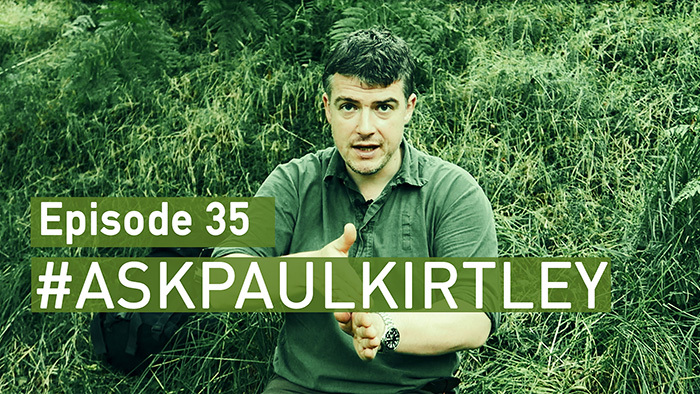 In this episode of #AskPaulKirtley I answer questions about top trees for bushcraft, dish cleaning in random camp spots with no water, the best time for carving, how not to get wet under a tarp (revisited), light saws for bushcraft, equipment for maintaining axe and knife at home. Good advice, as always, Paul. It sounds like “Where to pitch your tarp” could be a good subject for future tutorial/video? Yes, OK. Do you mean as in covering all the relevant aspects of deciding where to pitch? May be, that I am wrong. But my opinion is that we are the small group that survived all catastrophic situations, like the black death, for example, that killed in several waves in middle agest all the other people around us. I think, our bodys are able to deal with common bacterias of our living area. So, normally you should be able to eat a spoon of the earth of your own garden, without becoming ill, so far there are running no animals around like chickens on a farm, or somebody did some toxic things on the ground. Yes I wash my salad, but I eat surely some dirt, some garden earth with the salad, and a small slug or spider from time to time. The bird was sitting on the apple i eat without washing it. I do not clean my hands before smoking a cigarette in my garden after work, or eating something in between. That could kill me, surely. But normally people survive that! If you are a blond person with blue eyes living in Denmark or Hannover, your Family is living there since minimum 5000 years, if you are sitting in Britain, your family sits there since minimum 1500 years. The hole time eating every day a bit of uncooked earth! If you trained your personal body by doing this, playing in the sand as a little child, hurding yourself on socker field and by playing in the garden and forest, your body should be able to deal with the ground, that is around you. I dont know, where are the borders, and how long you need to live in a country, so I would not use that tecnique outside europe, and living in Berlin, I would not use that in Italy too. I take grass or other non toxic plants, do them in the pot and drill it around with a stick. I change the grass several times and continue till the pot is clean. The same and next day i can drink even cold water out of it, in the evening i cook tee or soup in it, the spoon i am just licking clean. It is only important that the pot becomes visuelle clean, so that the amount of rotting pasta is as low as possible. Fat from meet has to bee cleaned out with more or less clean sand. The sand i clean out with grass. I never did that outside of Germany. But in Germany i did that every year several times, i never became ill. I used toilet paper too for the mug, what works faster. Of course you lick before all that everything away you can reach. Cleaning with sand and grass takes a lot of time. I often used that as a prewashing and cleaned later in the next clear water i found. I do not recommend that to anybody, because that could kill you perhaps, i don’t know. I became till today 47 years old, and normally have no illnesses. I would not do that without sterilisation with fire outside northern Europe, because that is the area i am living in my life time. Be carefull, heat unclean pots, and know, that even that could perhaps not be enough, because, perhaps things could become somehow toxic, i do not know that. But don’t cook the salad out of your own garden!